Do you remember the first time you heard about the Hawaiian pizza? It probably seemed strange to you that ham and pineapple would work together as pizza toppings. And then you tasted it. And, wow, it works. Well, prepare to be wowed again. This time we’re putting fresh Ambrosia apples (thinly sliced) on a pizza with crispy bacon. The results is a sweet and salty pizza that is surprisingly delicious. For this recipe, we wanted to keep things simple so there are just 6 ingredients including the pizza crust. We used a store-bought, thin pizza crust which makes this a quick and easy meal to prepare. From prep to plated, this meal was done in 30 minutes! Just perfect for a busy weeknight. To change things up, we swapped in a smoky BBQ sauce for the regular pizza sauce and it really added a nice kick to each bite. We also prefer to top this pizza with a medium or old cheddar cheese instead of the traditional pizza mozzarella. We find that it shows off the Ambrosia apple and bacon better. Plus, with the above mentioned BBQ sauce, it creates a flavour-party in your mouth. If you prefer more subtle flavours, you can certainly stick with the traditional pizza sauce and cheese. On the other hand, if you want more toppings, you might consider adding roasted garlic, kale or fresh arugula on top. Let us know on social media if you do – we’d love to know how it worked out. But, we like to keep it simple and find that these six ingredients result in a perfect pizza. Read the directions on the pizza shell package. Some pizza crusts are pre-baked while others require baking before adding your toppings. If your crust is still frozen, be sure to pre-bake it before adding toppings. Place bacon in a frying pan on medium heat. Continue to flip slices until it reaches your desired crispness. While bacon is cooking, core and slice Ambrosia apples. We recommend thin slices. Spread BBQ sauce over pizza shell. Allow bacon to cool enough that you can chop the cooked bacon into small, bite-size pieces. Top pizza with onions, apple slices, and bacon. Cover with shredded cheese. Place pizza in oven and bake for 10 minutes or until crust is golden brown and cheese is melted. Let pizza rest for 5 minutes before cutting. This quick and easy midweek meal will be the new favourite. Forget about the Hawaiian pizza. 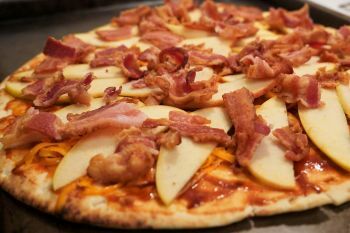 We’re declaring this Ambrosia apple and Bacon Pizza the “Canadian Pizza” since the Ambrosia apple was discovered right here in Canada.